- Click on "In" and select your midi file. - Click on "Out" and give a name without the extension (don't use temp.wav as output because it is used by the program as temporary file). - Click on "Convert one" and wait until it is written that it is ok. If you are unregistred, since the conversion stops at the middle of the file, you'll get a half-size output. Of course, you can change other options, but basically this is the core of the conversion. Remember that it is sometimes needed to change your sound card's settings to get a good sound (if you get blank files for example). 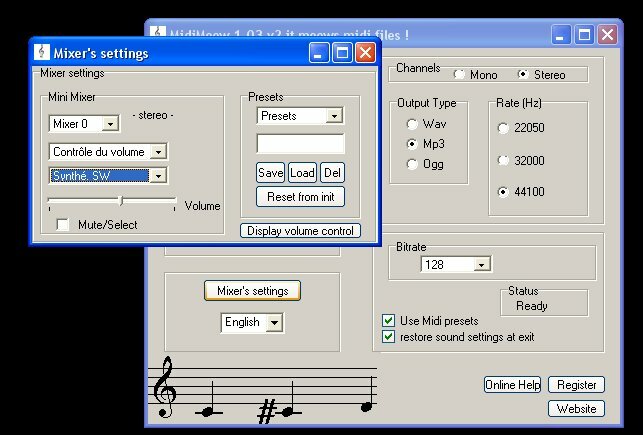 If you need to change your sound card settings: in this version of the software, you have to close the software, change your sound card settings, open the software again and uncheck "Use Midi presets". 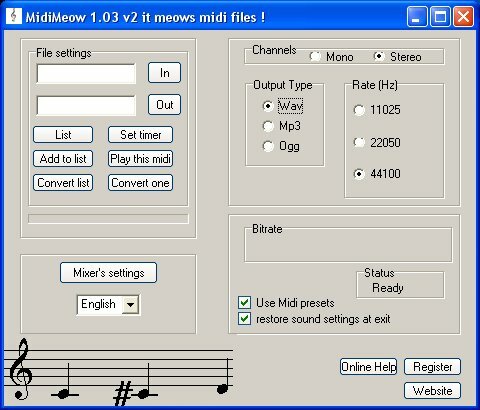 Put the file "key.ini", sent by Share-it, in the same directory as Midimeow OR go to the registration panel of MidiMeow, and enter your name (first line) and the serial number (second line). -How to use the list of conversion? - Select your sound settings (main window) and your ouput directory ("list" window) before you add a file to the list. Tip: You can select several files in the same time if you press on CTRL while you click, or you can select a whole list of files if you select the first file of a list, then press on SHIFT, then click on the last file of the list. It is very important to be able to select several files in the same time, because if you don't know how to do, then my bulk conversion mode is useless for you. Also if you decide to drag and drop several files, create a directory for the output. 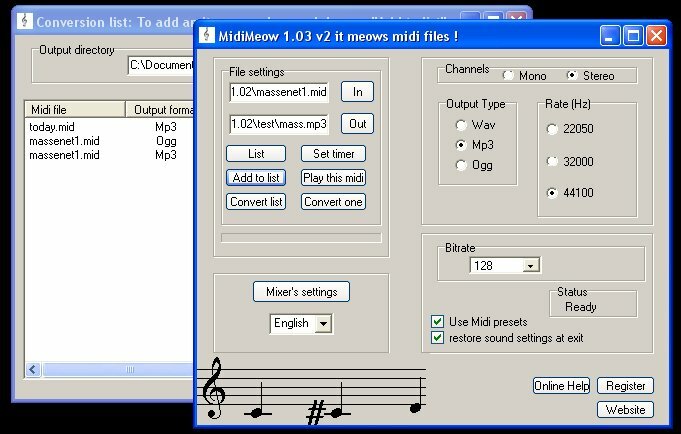 - A second option to create a list of files is to click on "in" (main window), then choose your midi file, then click on "out", give an outpout name then click on "Add to list". 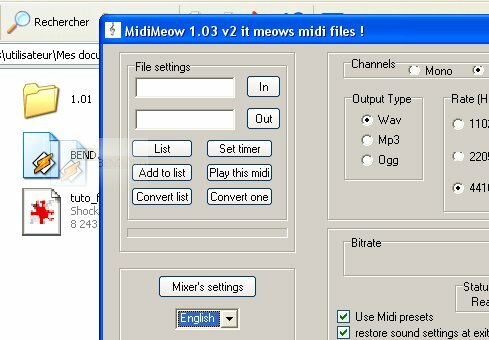 Do the same thing for all the midi files you want to convert. Just click on "Convert list" (main window) to start the conversion. -How to load and save your mixer's settings ? 1- Change your mixer's settings as you wish (you can use to mini mixer or click on "display volume control" and change what you want to change). 2- Click on "Save" to save your sound card's settings to the name that you have written in the text box just above the "Save" button. 3- Click on "Load" to load the presets that you saved previously (use the scroll box to select the good settings). - My Mp3 has a size of 0ko or my ogg has a size of 4Ko ? I corrected the most common bugs related to format compression but sometimes it can still happen. It is not possible to correct it for all files, and it is related to the third party library that i'm using to convert to mp3 or ogg. To prevent this bug select another sample rate or another bitrate for your files. It can for example happen if you choose 22050 Khz and 128 Kbps for a mp3 conversion with midi files above a given length. You should check that you are using correct mixer settings. For example, if you ear your Tv on your file or other unwanted sound, just mute your microphone. If the sound is too low, you can increase your midi input (better) or increase the record volume. If you get a metallic sound, decrease your midi input on your sound card. Open the file with windows media player, if your midi file has the same length with this player as the length of converted file, it means that there is a problem with your midi file. Stop the conversion manually or use the timer to set the good length. - How to convert kar files? Play track volume of the sound card is set too high: it gives unwanted noises on the resulting file. Record track volume of the sound card is set too high: it gives a metallic sound. On the resulting files the sound is too low or there is no sound or you can listen only the main sounds of the original midi file at a low level: the volume of the record track or of the play track is set too low (both or one of them). Thanks to Lionel93, administrator of the french board related to busker (click here for busker) for some ideas and a feedback. Same comment for the other testers of the board. Thanks to triblonto, webmaster of acanumlab (a website related to Arcanum ) for the idea of the software. Thanks also to the beta testers who mailed me (AW and JR).